I love bagels…..something about a toasted bagel just makes me happy. I love getting bagels from bakeries, but ya know sometimes I don’t feel like going out just to get a bagel. That would mean I’d have to put something on besides my PJs. Some days, that just ain’t happening. Can I get a witness?! 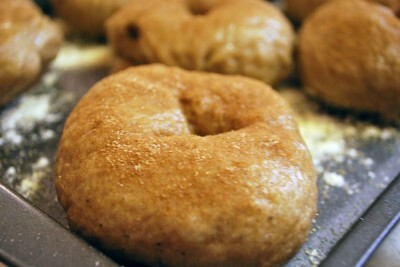 Homemade bagels make the ones in the store taste like shoe leather. It’s really not that hard to make homemade bagels, it just takes a little bit of time – just like anything you use with yeast. I LOVE baking with yeast. It’s so magical and bubbly…..and smelly. But smelly in a good way – not like with socks. 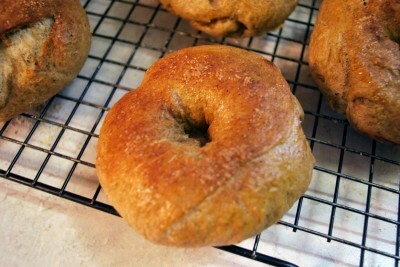 We’re going to make Pumpkin Spice Bagels today. This is just a tutorial to give you a general idea of how homemade bagels are made. I’ll include the recipe, but this will just give you the confidence to know that when you see a bagel recipe that you can actually do it….if Stacy can do it, you can do it. For these we’ll need bread flour, cornmeal, ground cloves, cinnamon, yeast, nutmeg, ground ginger, salt, brown sugar, egg, water, and pureed pumpkin. 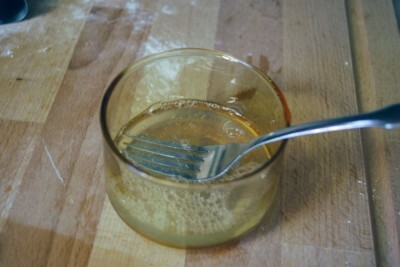 Grab a small glass dish and dissolve your yeast in warm water. My friend Kim told me that someone passed along to her how to know your water is the right temperature for yeast – make sure it’s no hotter than what you’d put a baby in for a bath. You wouldn’t want to scald your baby, and you don’t want to scald your yeast……the yeast won’t cry, it’ll die. Then again, you don’t want to put your baby in cold water either….your yeast will shiver and shrink instead of getting all poofy. 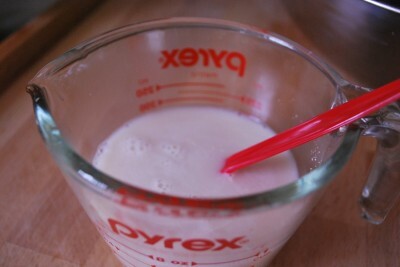 I always stir my yeast with a plastic spoon. I have absolutely no idea why – I just do it. It seems delicate. 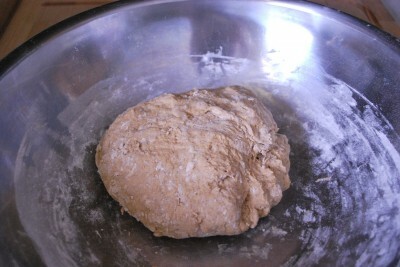 However, I’m not sure why I need to be delicate with it, considering I’m going to knead the heck out of it in a minute. 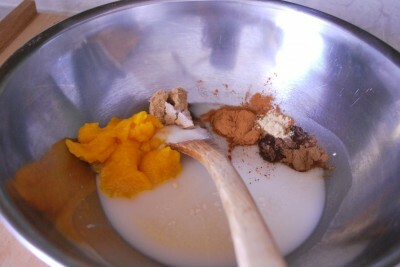 Now, pour your yeast mixture into a large bowl along with the pumpkin, brown sugar, salt, and spices. Mix it up well, but don’t get carried away. It’s sloshy and it will slosh right over the side of the bowl. 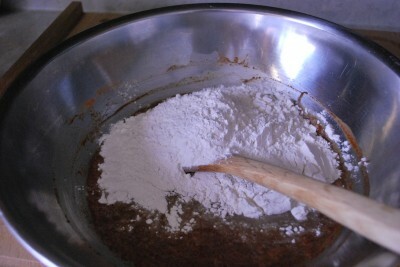 Now, it’s time to add the flour. We’re going to add about three cups of bread flour. Stir it until it comes together. A lot of times I will just mix it up with my hands because I feel like I can get a better idea of how it’s doing. You want it to look like this. It needs to be stiff enough that it becomes a ball as you stir it. If it’s not stiff enough, add a bit more flour. We’re going to knead it, so we need it to be stiff and not sticky…..or else it will be all over us and the kneading surface. 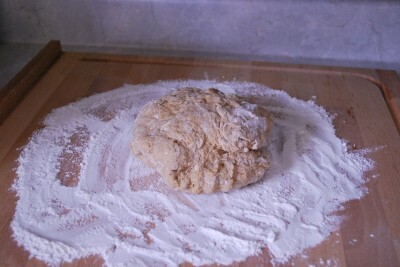 Put your dough out onto a lightly floured surface. As you can see, I went a little overboard with my “lightly” floured part. Oops. You can start with a little and add more as you need it. My dough looked like it had rolled through a snow drift, but I worked it out. 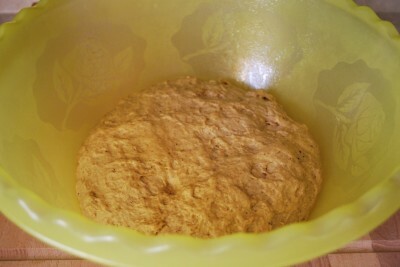 You need to knead it about 6-8 minutes or until it’s smooth and springy. Right about now, someone is going to call you on the phone – mainly because you have flour all over your hands and you’re trying to keep track of how long you’ve been kneading. 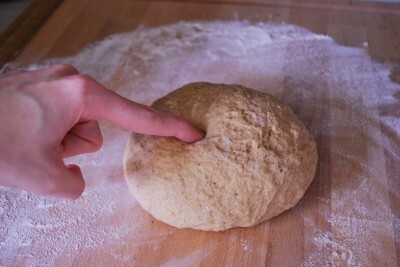 You will know you’ve kneaded enough when you poke it with your finger and the dough springs right back out. It’s fun. It’s okay if you want to poke it a few times just to watch. Put your dough down into a greased bowl. Make sure to turn it over so that the entire surface is lightly covered. This will help it not to stick to the bowl as it rises. As usual, I let mine rise in the oven with the light on. It gets pretty toasty in there. In fact, I’ve considered pulling a chair up to it and putting my feet in there sometimes during the winter when I’m freezing my toots off. You need to let it rise until it’s doubled. I think it took mine about 3 hours. The recipe states 1 hour……I don’t know that I’ve ever had bread ready in one hour. Bread has a mind of its own. It must be female. 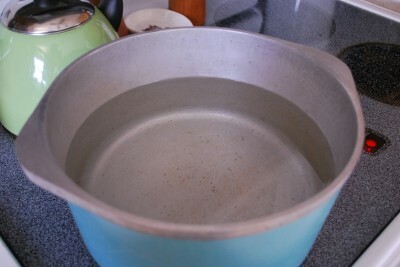 Grab a big pot and fill it two-thirds with water. Bring it to a boil. No, we’re not having a baby. We’re having a bagel. My dough is ready! Actually, it looked more poofy than this, but I poked it with my finger and it deflated a bit before I remembered to take the picture. Something about poofy dough just makes me wanna poke it. Put your dough back onto a lightly floured surface. Knead it just a few times and then divide into 9 pieces. Mine is only in 8 pieces, but they weren’t even. So, I pinched a little here and a little there and then I had 9 pieces. They weren’t all the same size….that’s okay. I’ll give Barry the little ones and eat the bigger ones myself. I can take the fall. Roll each piece into a ball. Take your finger and stick it through the middle. 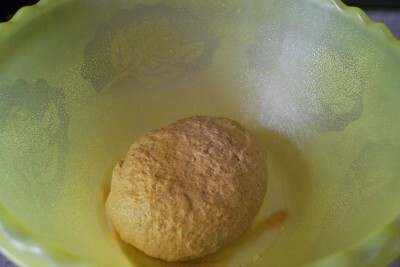 Work with the dough until it has about an opening in the center of about 1 inch. It should look like a doughnut. I put mine on my finger and just twirl it around until it looks right. I can’t hoola hoop, but I can do this! 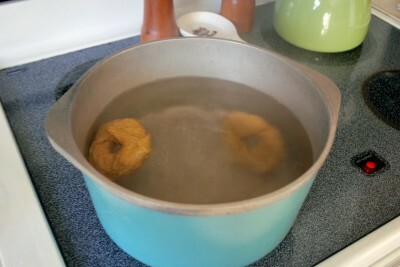 When your water is boiling, you’ll drop two bagels at a time down into the boiling water. Boil them about 45 seconds on each side. When one side is done, flip it over. This part is pretty weird isn’t it? Did you know bagels were boiled? Shocking. I like to shock people. I’ll spare you and not tell you anything shocking about me right here. You’re welcome. Get a cookie sheet and spray it with cooking spray. 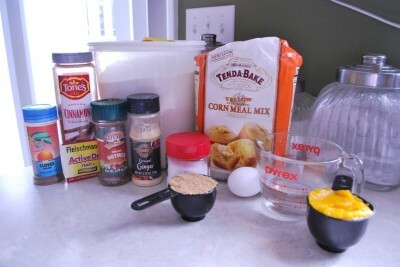 Then sprinkle it with corn meal. Why? Who knows. Most bagel recipes call for this part. I guess it keeps them from sticking. Ours is not to question why, just to eat the bagels. In a small bowl, mix up your egg white and a little water. Don’t get too happy and slosh it over the side so that you have to clean everything up with Clorox…..that happens to me every time. 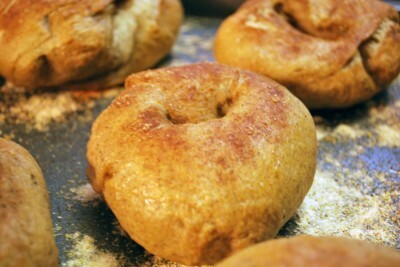 Place your bagels on the corn meal baking sheet and brush them with egg white (also called an egg wash). This makes them look nice and pretty when they bake. Sorta shiny. 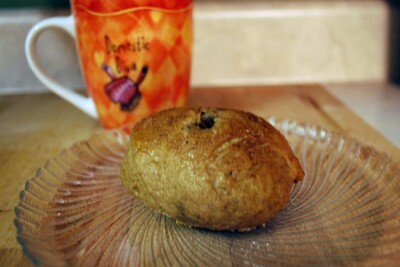 I sprinkled mine with cinnamon sugar after the egg wash. I just love cinnamon. I try to put it into everything I can think of. Pumpkin and cinnamon just go together. Bake them in the oven until they’re nice and browned. It might be hard to tell since they’re sorta already brown from the spices. If you’re in doubt, cut into one and check. Remove them from the pans to cool on a wire rack. These are just so yummy! They’re not dry like some bagels you get in the store. I think you’ll be pleasantly surprised at how good they are and how easy they are to make. The cinnamon sugar really topped them off nicely. 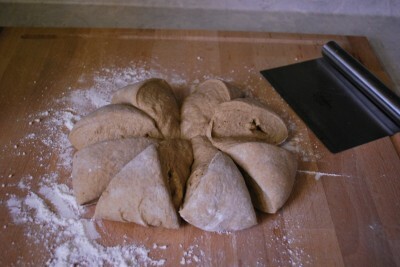 When cycle is completed, turn dough onto a lightly floured surface. Shape into nine balls. Push thumb through centers to form a 1-in. hole. 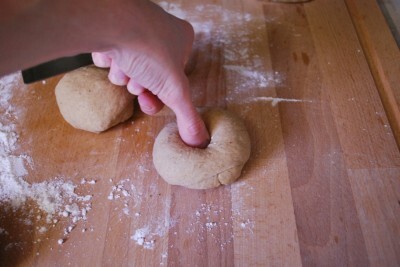 Stretch and shape dough to form an even ring. 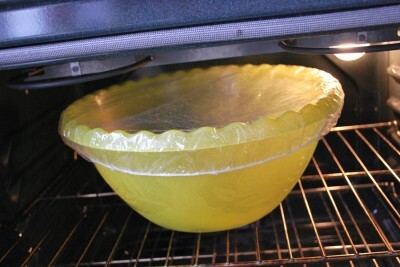 Cover and let rest for 10 minutes; flatten rings slightly. Fill a Dutch oven two-thirds full with water; bring to a boil. Drop bagels, two at a time, into boiling water. Cook for 45 seconds; turn and cook 45 seconds longer. 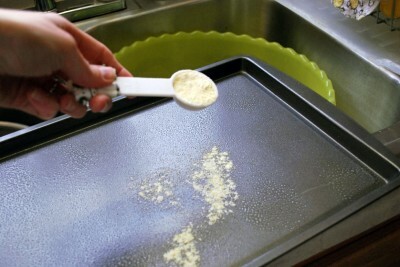 Remove with a slotted spoon; drain on paper towels. 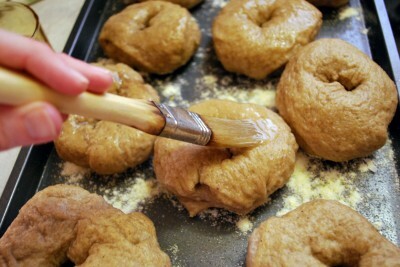 Whisk egg white and remaining water; brush over bagels. Coat a baking sheet with cooking spray and sprinkle with cornmeal. Place bagels 2 in. apart on prepared pan. Bake at 400° for 15-20 minutes or until golden brown. Remove to wire racks to cool. I love your sense of humor.You are the type of person I love to work in the kitchen with. AWESOME!!! I’ve been wanting to make my own bagels, but I guess was intimidated as I’ve never done it before. But there are *great* and easier than making bread I’d say! 🙂 (Altho I wish there wasn’t the extra pot to wash.) Everyone loves these, even hubby (who tends to like store-bought stuff), so I’d say these are definitely a keeper! Next time I’ll double the batch. Next bagel flavor will have to be peanut butter chocolate chip (the Bagel Factory on the UofMichigan campus makes those (well 20yrs ago – don’t know if they’re even still there) and I have not been able to find them anywhere! Thank you for your wonderful pics & tutorial!! I haven’t made them since we got the Nutrimill. I think I’m gonna need to now! 🙂 My favorite flavor is Super Cinnamon from a local pastry shop. Yummo! So these were super yummy fresh. I saved the remainder for bfast the next morning (we ate them after dinner) and they weren’t nearly so good the next day. I’m wondering if freezing them in between would help. I can’t see getting up early just to make bagels for bfast. 🙁 Or maybe make ’em up to the point of boiling, put ’em in the fridge & finishing ’em up the next morning…? You need to make a short video of yourself eating what you make and telling us how good it is like they do on the Food Network lol! 🙂 I’m still getting over a cold, so I can’t taste anything….so it wouldn’t work this week! 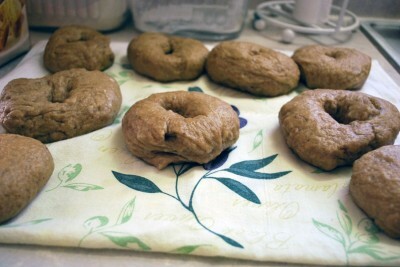 I’ve always wanted to try homemade bagels but I’ve been intimidated by them. This looks easy enough to try! I think I’ll give it a shot after Thanksgiving. Thanks for the recipe!